H.E. 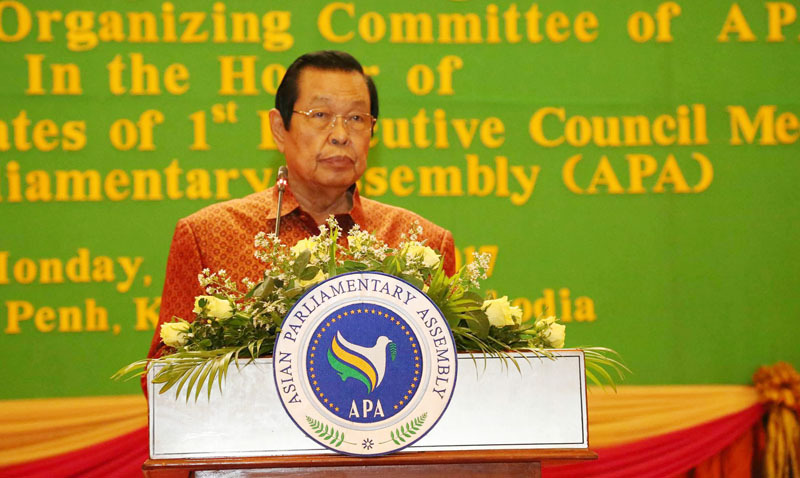 Dr. Nguon Nhel, Second-Vice President of the National Assembly and Chairman of the Organizing Committee for the First Executive Council Meeting of the 10th APA Plenary Session, mentioned that the close-tie friendship, solidary and fraternity of the APA member countries is from the joint-efforts of high responsibilities and these factors are the important sources in promoting this parliamentary forum to achieve result that we should be proud of. H.E. Dr. Second Vice-President spoke to parliamentarian delegations from 26 countries in the First Executive Council Meeting hosted by the Cambodian parliament from 1-4 October 2017. Evening on the same day, Cambodian parliament hosted a dinner reception for all the delegations. The dinner reception was warmly welcomed and presided over by H.E. Dr. Second Vice-President. During the occasion, H.E. Dr. Nguon Nhel said that for a full day, Excellencies, Ladies and Gentlemen, have devoted a great deal of time, energy, and spirit with high responsibility, in order for the Asian Parliamentary Assembly to step forward and improve day by day. He added that if there is no participation from Honorable Delegates, Excellencies, Ladies and Gentleman at this moment, the Asian Parliamentary Assembly could not make this meeting a fruitful outcome. "I would like to thank the Organizing Committee and staff officials of the Secretariat General of the National Assembly-Senate who have worked hard to organize the meeting smoothly and successfully." Please be informed that the Cambodian Parliament has hosted the First Executive Council Meeting of the 10th APA Plenary Session from October 1 to 4, 2017, and the outcome of the meeting will be extended to the next meeting of the Second Executive Council Meeting of the 10th APA Plenary Session in Turkey in the late 2017.